Converge Virtual Terminal is a direct connect application enabling you to use your Laptop, Desktop or tablet computers to process credit card and debit card transactions. Extensive reporting and back office functionality makes this service ideal for Mail & Telephone order businesses. Multiple computers can be configured as well as Smartphones and E-commerce allows for consolidated reporting and management activities. Included with Converge Virtual Terminal is the ability to process credit card transactions using your Smartphone. Converge Mobile Terminal is available free of charge for iPhone and Android phones. No terminal requires, use your Laptop or Desktop Computer, Tablet, etc. 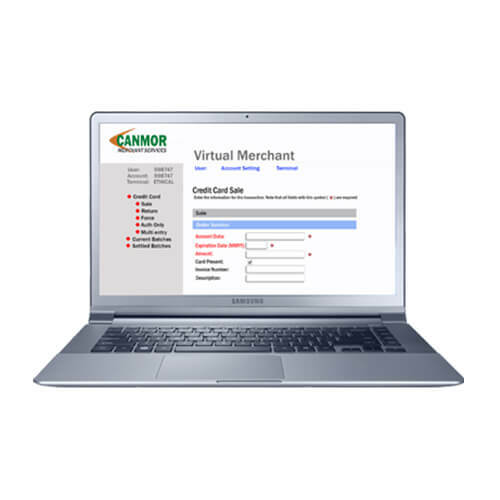 Connect multiple computers to one Virtual Merchant account. Mail Order & Telephone Order business.